Easy Wi-Fi for AT&T is no longer free, Al’s hard drive adventure (RocketFish enclosure, ICYDOCK enclosure. ScreenSteps live webinar at Blue Mango Learning. Etherpad for easy collaboration online at etherpad.com. Slideshare at slideshare.net for sharing of PowerPoint slides, and ScribD at scribd.com for sharing everything else AND PowerPoint. In CCATP we talk about the cross-platform 0 day exploit for PowerPoint microsoft.com and then we take the unpopular position of questioning the MacHeist while acknowledging their marketing genius. Send an email to Steve at podfeetsteve@spamex.com if you want to contribute to show #200. Today is Sunday April 5th, 2009, and this is show number 198. Only two more shows till #200! It appears that Steve is cooking up something for show number 200, chat with him on twitter at twitter.com/spsheridan if you want to get involved! Last week on the show I talked about a sweet iPhone application that removes all the drudgery out of connecting into the AT&T wireless network at Starbucks for free. I know, how spoiled am I? Well I told you it was free, but Reza left a comment on the blog. Here’s what they said, “Easy Wifi for AT&T is now $0.99. You’re show does make a difference.” Oh man, that’s not what I wanted to see happen! Oh well, I would totally pay a buck for that application! Ok, this is all Bart’s fault, just so you know. He started it with all that “your backups to DVD aren’t any good you know crud.” So I had to find a better backup strategy for my home movies, which I did with DVD Imager. I know, I already told you all about that. But now that I had a tool to make disk images of my home made DVDs, now I needed a place to put them. Good news, I had salvaged a drive from an old enclosure that was irritating me (the power cable kept falling out in the middle of file transfers). I also had another drive from an enclosure that had actually failed but the drive was fine. So I’m good – I have two drives, just gotta pick up an enclosure or two. Office Depot is close by, and I know it’s not your tech mecca or anything, but I had to be a little bit surprised when the guy helping me there did not know what an enclosure WAS, much less be able to find one. I decided to make the longer trek to Best Buy and while their supply was limited and they were overpriced, they did have a couple of enclosures and I wanted to stop procrastinating so I bought a really cool one called the RocketFish. It’s a flaming red with fins on it! I think I paid around $60 for it but amazon has it for only $22. I like to support local brick and mortar stores but man, triple the price for instant gratification? Ok, so NOW I should be able to start the great backup adventure of 2009, right? Nope, I’ve still got one more bare drive, so I decided to go with monoprice.com to get a killer deal on an enclosure. They’re rock bottom prices on cables, thought they might have a good deal. I found an IDE enclosure for only $14! w00t! 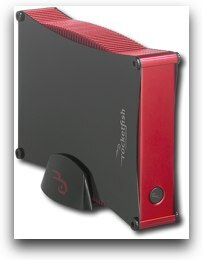 Ordered that bad boy, got it in, and then realized that my last drive is a SATA drive! For those of you not versed in boring connector technology, older drives used these really thick, practically inflexible flat ribbon cables with this really annoying wide connector that hurt your little fingers to pull in and out. A few years back they started using SATA connectors, or Serial ATA. IDE is the same as PATA, which stands for Parallel ATA which is also referred to as plain old ATA. With me here? PATA=ATA=IDE=big annoying cable and connector. SATA is faster, thinner and easier to work with. So after that technical sidetrack, the bottom line was that my salvaged drive wouldn’t work in the $14 IDE enclosure. So back over to Best Buy where I discovered it’s really hard to find an IDE drive these days. Sigh. So I overpaid, I think it was $80 for a 500GB IDE drive. Great. I went to put it in, and discovered that in this one case, I got what I paid for in that $14 enclosure. With a normal enclosure, there’s a connector panel with two rails that come out of it. You get 4 screws that go from the rails into the drive, holding it in place into the connector. then that rail/connector thing screws into place sliding into the enclosure. Well this FINE $14 enclosure dispenses with all that tomfoolery – all you do is grab the IDE cable and plug it in, plug in the power connector, then dangle that mess down into the enclosure LOOSE, and just two screws hold the connector panel and switches into place in the enclosure. Well, that would be true if I hadn’t managed to lose one of these tiny machine screws! So now I have this panel half coming loose hanging out of the enclosure. Sheesh. then I thought I should work out what my requirements are. I figured the one that should be fastest should be the home backup because I have to leave my laptop tethered while the backup runs, so I thought I should let myself use my snazzy ICYDOCK Firewire drive for that. then I remembered Steve saying that the ICYDOCK was too noisy for him. Hmmm…went to try the ICYDOCK, with the terabyte drive that Honda Bob gave me, and guess what? That noise that was bothering him was a failed disk drive! that thing was clicking away like crazy, the classic dead or dying drive noise. Sigh. I thought at first maybe I could use one of the salvage drives from the beginning of this story, but then I realized that the ICYDOCK is a SATA drive, and the salvaged SATA drive is only 250GB, and I already documented that my backup drive has to be at least 300GB! you DO realize what that means, right? Yes, I had to buy ANOTHER drive! AAAAGGGHHH! so this time I went to buy.com which frequently has killer prices, and I found a 1TB Seagate 7200RPM SATA drive for only $80 with no shipping. w00t! Sent away for that bad boy and when I got it I figured out why it was so cheap – it’s the Barracuda 7200.11 which is the one that had the big firmware problem a little wile ago. Well, my mom and dad had a theory – that whoever just messed up really badly recently is probably REALLY careful right now. In the 1970s, they bought a Pinto AFTER they started catching on fire in rear end collisions! My parents figured that the most careful, safety conscious product line on earth at that moment was probably the Ford Pinto line. They would even fly the airline that just had a crash – again who’s going to be more careful! So I guess I’m following in their footsteps by getting the disk drive that just had bricking problems because of bad firmware. I guess I should go check that firmware version though, shouldn’t I? I plan to, I really do. Ok, so we have ONE backup thing figured out. I started up SuperDuper! and ran a full clone backup to the terabyte drive. i know, it’s overkill when I said I only needed 300GB but I’m sure I’ll find a use for it at some point. Next up – that darn offsite backup that Bart is making me do! So now I have to make a decision. I have that stinky $14 enclosure with a perfectly good 500GB IDE drive in it hanging off with one screw, or I can use the gorgeous Rocketfish enclosure which I put the second salvaged 300GB drive in. (You probably can’t remember back that far in the story now, can you? there were 2 salvaged drives at the beginning.) Steve told me at this point that if I didn’t stop talking about hard drives and backups even HE might stop listening! That’s not going to stop me though, is it? Well we have to look at the 3rd requirement to figure out what to do. The third requirement, if you can remember that far back, is for backing up our home movie DVDs. 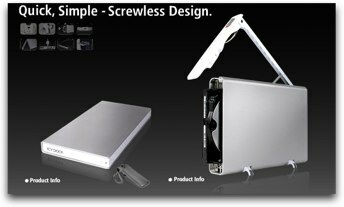 If I’m going to keep my DVDs at home on that backup drive, I want that awesome looking enclosure. You know what though? I think if I keep debating all of this I will NEVER get this plan off the ground! Ok, right here and now, I’m deciding. The Rocketfish goes to work for backups there. Ok, good, that’s two down. That leaves me two choices for the DVD backup strategy now – I have the cruddy enclosure with the new 500GB IDE drive, or the one drive I haven’t told you about. See, there’s suspense in this story! A whole new character emerges! Oh the drama! Isn’t this exciting? Before I started all this nonsense (remember it’s Bart’s fault, right?) I was running weekly SuperDuper! backups using an iOmega 500GB drive. The good news is I don’t have a clue whether it’s SATA or IDE so I’m not going to bore you with THAT again! Well now I’ve got it. The iOmega 500GB drive ends up as the DVD backup drive, and guess what I do with the brand new 500GB drive in the $14 enclosure? Why I’ll tell you! I sell it to my friend Ron! See there’s yet another hidden plot in this story of intrigue. when I got the $14 enclosure, I actually got Ron to buy one too – in fact he bought both of them and I still owe him the $14!! But he asked me the other day for the source where I bought the 500GB drive. So I sell him mine, less the $14 of course, and I put the $14 enclosure in the pile of things I just might need some day, which saves me the trouble of finding that tiny machine screw! I don’t believe this, my nightmare is finally over, I can finally START backing all these things up! And as I close this tale of technology, this tale of terabytes, I hear faintly the words of Bart when we were talking about the Drobo…saying that it would reduce hard drive clutter…. The developers will also make time at the end of the webinar to answer any questions that you might have. I put a link in the shownotes to the registration form for the webinar so be sure to go check that out. It REALLY helps to see ScreenSteps in action to “get” how cool it is! 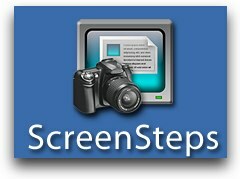 I would be remiss if I didn’t mention that we have a coupon code for ScreenSteps – after you watch the seminar and realize that you can’t live with ScreenSteps and ScreenSteps Live, click on the buy now button over at screensteps.com and then enter the code NOSILLA for 25% off the purchase price of ScreenSteps. This week I got a great tip from my friend Bruc Barr about a site called Etherpad. This is one of those things that’s going to break open the way we think about collaboration. 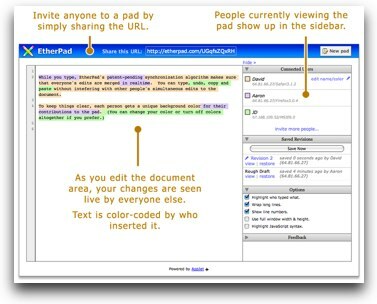 Etherpad is a web service where a group of people can type onto a web page all at the same time. Now that sounds like a weird idea, but let me give you an example of where I could think of this helping me immediately. I usually do the shownotes when I’m on the Mac Roundtable, and during the show i’m frantically trying to catch urls and names of products while other people are talking, AND trying to remember what I mean to say (that explains why I frequently make no sense). With Etherpad we could start a session at the beginning of the show, I could still do a lot of it but if I misspell a product name, or I don’t catch the url, they can just plop it in there while we’re talking instead of a bunch of emails afterwards where i’m asking for clarification. At the end I’ve got the shownotes! Now that I’ve explained a problem it could solve, let me walk you through it so you get a better feel for it. First navigate to etherpad.com. click on Create New Pad. Seriously, that’s all you do to start. No signup, no getting a password back, nothing, just start. When you create your new pad, you’re given a unique Etherpad url – it’s etherpad.com/biglongalphanumeric. You copy that url and paste it into a chat with whoever you’re working with. What you see is a big area on the left where you can start typing. They put some example text, but just select and delete it. There’s a sidebar on by default on the right, and at the top you see Connected Users. When you first navigate to that site, you are given the name Unnamed and assigned a color for your text. Click on unnamed and you can change your name and your highlight color. Below the list of connected users you have a chat window so you can make sidebar comments while you’re collaborating. So now here’s the crazy part – you can ALL type at the same time! you can correct each other’s spelling, add to sentences others wrote, heck you can even delete what someone else wrote. Everything is color coded so you can tell who did the editing too. Darren Rolfe of macwingnut.com and I did some messing around with this and we both instantly had light bulbs go on in our heads. He invited in Tom Peraino (twitter.com/twoarmtom) and right away Tom started collaborating with us. We invited Don McAllister of screencastsonline into the session by pasting the url into a direct Tweet in Twitter and soon he was in there collaborating as well. Later I tried it out with Crazy Listener James and while he was a lot slower on the uptake than Macwingnut, even he eventually grasped how cool it is. He wandered off after a bit and showed his team at work how Etherpad works and within minutes they were talking about the problems it could solve for them. One thing you do have to do is take note of your url, if you lose it you’re dead. HOWEVER, they made it easy to create your own custom url. Let’s say you’re working for Bob’s toy shop, you could create a url called etherpad.com/bts_001 for your first collaborative goal setting session, then next week’s staff would be at etherpad.com/bts_002. All etherpads whether they’re custom urls or auto-generated are saved forever. The basic service with no security is free to use. But lets say you want to be able to keep your work private – they sell a service where they host it for you and protect your information and charge you a monthly fee. Need an even more secure model? Want it inside your firewall? They’ll let you run your own EtherPad server inside your organization’s network and pay once for a perpetual license. They even have a free 60 day trial of the Private Network Edition and instructions on how to install which they claim is really easy to do. This is something I wish more companies would do – not just come up with something amazing on the internet, but allow me to buy it for inside a corporate network! So many times people think small, when companies frequently (well maybe not right NOW) have the money to buy a service like this for inside, which helps the developer be able to give it away for free on the outside. After all this, you’re probably wondering why I brought this up in the first place. Well I do have a big hate-on about Powerpoint but I’m going to tell you something cool you can do with your Powerpoint slides if you can’t help but make them. 🙂 I want you to check out slideshare.net. This is a site where you can upload your slides and then share them (duh) with anyone and THEY don’t have to have Powerpoint to watch them! Even better, tons of other people have put their presentation slides up online here so you can find tons of great material up here. You know how people send you those slideshows, like of that really amazing tropical island to make you jealous? Or of that insanely huge yacht with a helicopter pad and it’s won submarine? Well those files are HUGE, and require you to own Powerpoint (or maybe Open Office can open them) but there’s no reason to send them any more – just find them on SlideShare. Right now they’re featuring a slideshow on iPhone Coding for Web Developers. Now I don’t actually USE Powerpoint to create anything so I can’t test out the upload and sharing process but if you do, let me know how well it works. If you just want to learn what other people are working for, go check out slideshare.net. With Scribd’s iPaper document reader, anyone can easily upload and immediately share their original works on Scribd.com or any other website. iPaper transforms PDF, Word, PowerPoint and many other file formats into an elegant web display. Your work can be shared with Scribd’s community of passionate readers, and because every word of your document is indexed for search engine optimization, your screenplay, novel or even sheet music and recipes also can be discovered by the world. You can create (or liberate from your hard drive) anything you want to share – that comparative essay on Nietzsche and Kierkegaard, the first three chapters of the book you’ve been meaning to finish, journal entries from your trip to Thailand… Scribd provides a creative and useful new platform for readers, authors, publishers and anyone else seeking to express themselves, share ideas and exchange information. On the site they say that 50,000 documents a day are uploaded, and they have 50 MILLION readers a month! I poked around and found full novels online in their iPaper format. this is definitely a cool place to find documents and to upload them. i like that you can put something up here and then embed it over on your own blog letting them do the iPaper thing. I embedded a cool WordPress installation guide from the Department of Information Science & Engineering in the Gogte Institute of Technology in Belgaum, India. how cool is that? Should I worry that I DREAM about Honda Bob’s Mobile Service? Last night I had this dream. Steve’s sister was talking to a friend of hers. She was berating her for having sold her Honda and bought another brand of automobile. She said to her friend, “remember how last year when you had that problem with the valves in your car? remember how you called Honda Bob and he fixed it? And do you remember where you were when he fixed them? YES, you were sitting in your own house watching TV! Why on earth did you not get a Honda again?” I swear, I am not making this story up. I am such a believer in Honda Bob’s service that I dream about it. Sheesh, I gotta get out more! Well if you would like the kind of service I dream about AND have in real life, give Honda Bob a call at (562)531-2321 or shoot him an email at hdabob@aol.com. you should check out his informative website over at hdabob.com too. Remember, only Hondas and Acuras, and only in the LA and Orange county areas. Sorry Australia…and Canada…and Belgium…and Peru..and Minnesota…well you get the point. HDA Bob’s Mobile Service is not affiliated with Honda, Acura or Honda Worldwide. When i wrote to the Macheist people, Mike Lary wrote back "the other apps will be unlocked before the sales drive is over". do they mean that the hype is fake, that no matter how many people buy, you always get all the apps? 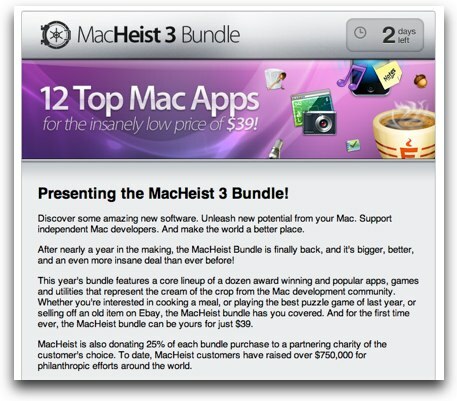 Bart and Al walk through each of the MacHeist apps and debate whether the apps are worth the $39. After Bart and I finished recording I checked the US CERT on PowerPoint and discovered that the vulnerability does not appear to affect Office 2007 on Windows or Office 2008 on the Mac, so if you’re on the latest versions it looks like you’re ok. Makes me wonder if they fixed it in the later versions on purpose or just got lucky. Seems if they fixed it on purpose they’d have gone back and patched the old ones, doesn’t it? We also realized when we got done recording that we had gone on WAY too long, and with Bart not being around next time we decided to chop the middle out of this week and move it to next week. You may not have noticed the cuts in next week but our tomfoolery trying to explain what we did next week will surely tip you off. I think it’s pretty funny actually. That’s going to wrap it up for this week, keep those dumb questions coming and all the great helpful suggestions, by sending me email at allison@podfeet.com and be sure to follow me on Twitter at twitter.com/podfeet. Don’t forget to shoot Steve a note if you’re interested in contributing to the 200th show by following him on twitter at twitter.com/spsheridan. Thanks for listening, and stay subscribed. Hey Allison, I’m still not finished listening to the show, but I wanted to let you know your link for etherpad.com is messed up. Looks like there is some extra code or something in there. It sounds like a really cool site, so I wanted to check it out immediately! thanks so much Debbie – I had found that problem earlier but I evidently had some version control issues. thanks for catching it – it should be good now!